Before she became Wonder Women, Diana, the princess of Amazon, was trained to become an unbeatable warrior. After leaving her homeland, she’s about to reveal her greatest strength… and her destiny. Playtech’s blockbuster slot machine with 5 reels, 4 rows and 30 fixed paylines created in cooperation with DC Entertainment focuses on Diana’s clash with her archenemy Cheetah, introducing 3 in-game Bonus features and 3 unique Free Spins rounds. There’s also a jackpot of 1000 coins of which you can read more in the Wonder Woman slot review. Want to see how Wonder Woman works? Select a recommended casino site from the list below and start playing for free or real – our screenshots will give you a sneak peek! The action-packed slot machine takes you to the island of Themyscira invaded by Cheetah who want to put the longstanding battle to the end. Before everything turns into punches and strikes, players have to say will they play for fun or for real money. Their decision won’t affect the gameplay where is required to collect 3 or more matching icons on adjacent paylines and collect the corresponding prize. Depending on your ambitions and experience, set the coin value between €0.02 and €10 and wager from as low as €0.30 up to €300 per round, as per your respective betting strategy. Wonder Woman’s logo works as the Wild and may replace all symbols but the Scatter. Also, Wild improves the payline, while 3, 4 or 5 of a kind pay 20, 60 or 250 coins, respectively. 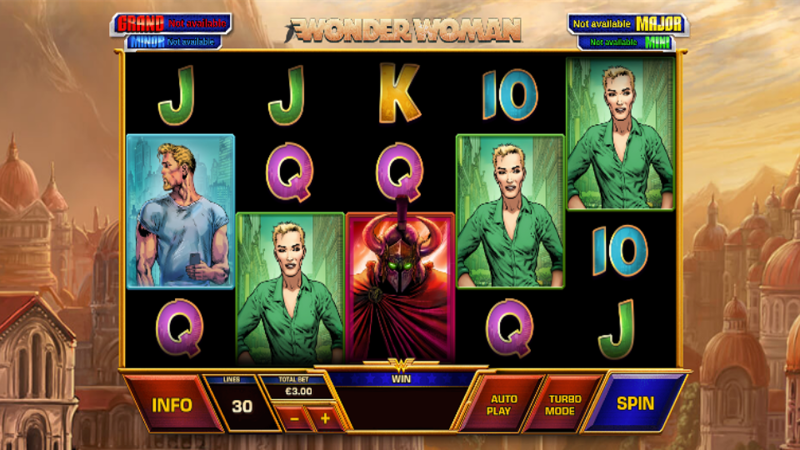 Land a Fire Wild and activate the Wonder Woman Bonus in-game features: a fully-stacked Diana symbol on the reels 1 and 5 activate the Re-spins game, while Barbara will turn into Cheetah. This is where you can land a big win of 1000x money invested should 20 Diana symbols occupy the entire setting. The same features are present in the Wonder Woman Free Play mode, but you will get to play with demo credits instead of proper cash. The paytable also favors themed icons regardless of activated mode and pays 4 to 150 coins for characters you faved or disliked in the comic book series. On any spin, lucky winners can score a Mystery Jackpot and take a progressive Mini, Minor, Major or Grand Jackpot prize. When 2 Scatters land on the reels 1 and 5, you will activate the Wonder Woman Free Spins and claim 1 to 3 rounds at the casino’s expense. Also, you have to choose between 3 featured concepts. The Wonder Woman Free Games are played with 1 symbol stacked on the reels, The Cheetah Free Games grant up to 12 additional spins, while Fire Wild Free Games contain Fire Wild on the reels 2, 3 and 4. As the game is completely built in the HTML5 technology, you can play online on iPhone, Android smartphones and tablets without a need to download a special app. 3. What is the RTP factor of Wonder Woman? Official RTP info is gathered on the Playtech-powered sites, so our Wonder Woman recension sticks to the figure of 95.34%. Designed as a comic book and packed with rewarding features, this is a challenging yet highly-rewarding game recommended to both DC fans and jackpot chasers. Thanks to the Wonder Woman tips, your winning odds will be much higher.